Cabe is up early. It is the day of the trial. Sly comes in. Cabe asks where the team is. They are already at the court. Meanwhile, the gang is doing all they can to make the judge mellow. They read in a study that lenient sentences are handed down when the judge is in a good mood. Happy messes with the courts inside temperature. Paige bumps up against the judge in the parking lot with plenty of lavender aromatherapy body spray. Walt fixes something at the coffee stand. Inside the court, another judge takes the gavel. The original judge had an emergency. The team has tapped the court and is watching from the warehouse. Sly is having trouble with his opening statement after the judge calls Cabe’s prior military duties irrelevant. Happy is having trouble with the visuals and audio, picking up on an emergency call that involves a dog. She notes that the fire trucks headed to the scene of the dog rescue will sink given the area is filled with loose sand and silt. 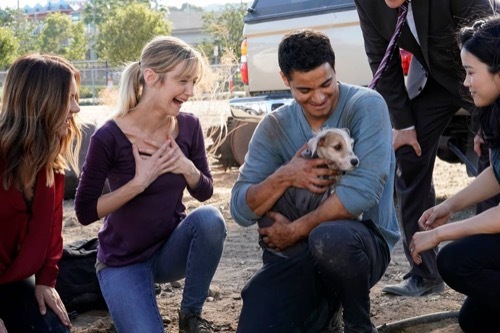 Since they cannot help Cabe and they cannot listen in, they decide to help save the dog. Happy tries to talk the officer at the scene and stop him from allowing the fire trucks through. She finally gets him to agree. The owner of the dog arrives. She is frantic. Her dog has diabetes. Toby asks to place the same device Collins was wearing around his wrist. He agrees. Oops, Sly forgot the key in his briefcase. He heads back to his seat to get the key and hits the button, shocking the judge. Cabe looks beside himself. Cabe tells him it is all part of the plan. The judge is angry and denies Sly’s defense. The gang tries to comfort the dog from above. They regroup and try to come up with another plan after their first plan doesn’t work out. They discover that there is a drain at the bottom of the cistern where the dog is. All they need to do is plug in and fill the hole with water, lifting the dog up. His leg might be injured but he can float Toby points out. While working on rescuing the dog they get a visit from Homeland Security. The agent witnesses Paige yell at the gang to get it together. They are all beating themselves up over Cabe’s trial. Walt won’t stop eating, Happy keeps berating herself and Toby keeps doing dangerous things. Cabe takes the stand. He answers the questions successfully until he is asked about the bank account in his name with $50k in it. He gets upset on the stand, turning to tell the judge that he had nothing to do with it. He was set-up. An idea comes to Sly, he jumps up and asks for a continuance. The judge laughs and gives him 15 minutes. Sly calls Toby. He needs him to track down an old case. That’s their hail mary. Walt climbs through the drain below. He comes face to face with the dog that is shaking. He thanks him for being a distraction. Walt seals the hole and promises the dog he will see him in a bit. Paige fills the hole with water. The dog starts paddling. Toby finds the case under glass at the local library. He smashes the glass and calls Sly, who presents an old case about a hip captain who released his prisoners because of peril. Walt reaches into the hole to grab the dog, who is going under. He is becoming to weak to keep swimming as the hole fills. The dog begins to drown. Walt gives up. The Homeland Agent is mad. He heard Scorpio was a little crazy but always got the job done. They are motivated to figure out another way. They connect a tube to the car’s exhaust, creating bubbles in the hole, making the dog rise. They pull him out and give him CPR. He is okay. Meanwhile, at the court, the verdict is in. Sly’s reference to an old case has won Cabe his freedom. He can go. Back at the warehouse, Cabe is humble and quiet. He thanks them all and heads home to get some rest.